Deer Park Ravioli has occupied this storefront just south of the LIRR tracks for more than 50 years. It is owned by Tom McDonald and Ernie Oliviero, whose father, John, purchased the store from its founder Tom Messina in 1973. Ernie took over the reins in 1985, and McDonald, a former food-service client, came aboard in 1991. The pasta dough, made from durum semolina wheat and water, is mixed in a huge circular mixer that dates from 1911. (Its exact name has been lost in the mists of time; McDonald and Oliviero refer to it as "the gramela.") 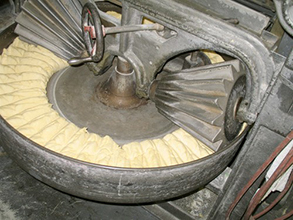 Most commercial pasta operations mix their dough with a "laminator" that presses the dough between two rollers to knead it. Deer Park's machine consists of a huge, donut-shaped trough. As the trough slowly rotates, two sharply grooved, conical rollers press into the dough. No modern machine, the men believe, can deliver a dough with as fine a texture as can the old gramela. Deer Park Ravioli supplies more than 250 restaurants and specialty stores on Long Island with more than 50 varieties of filled pasta. That means that when a menu features "homemade crabmeat-and-basil ravioli" or "homemade asparagus-and-smoked mozzarella ravioli," the kitchen may well be serving something "homemade" by McDonald and Oliviero. Even more of their ravioli (and cannelloni and manicotti) are shipped by food-service wholesalers to 7,000-odd national outlets. The retail store, virtually unchanged since it opened, sells more than two dozen varieties of filled pasta, plus nonfilled fresh pasta such as lasagna and fettuccine as well as Oliviero's tomato, meat, marinara, vodka and pesto sauces. There are plenty of chef-inspired flavors - broccoli rabe and roasted garlic, smoked salmon and Gorgonzola - but Oliviero says that "our older Italian customers say, 'just give me the cheese.'"